If you feel shockwaves emanating from the Midwest, that’s because Minneapolis is right in the middle of a Very Serious Local News Emergency. 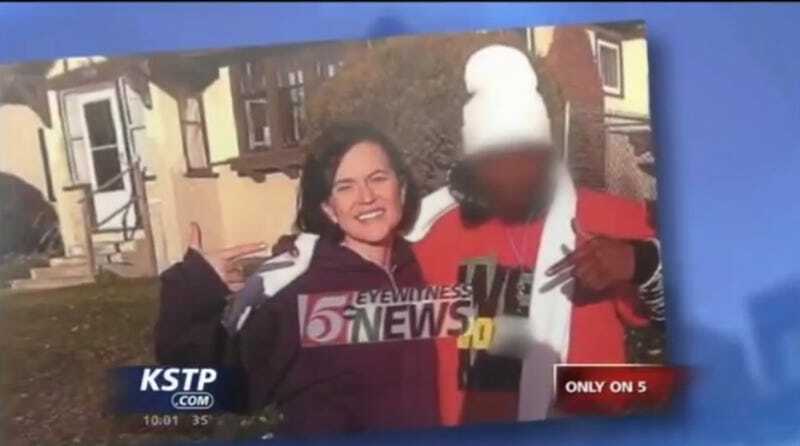 The ABC affiliate received a tip from their unnamed but presumably very credible law enforcement sources that Mayor Betsy Hodges was seen with a “known criminal,” flashing gang signs. That is all true, if by gang signs we mean “pointing at each other,” which is what Betsy Hodges and the young man in the photo were actually doing. Field reporter Jay Kolls cuts in there, to let us know that Hodges and the man are displaying “what law enforcement agencies tell us is a known gang sign for a Northside gang.” They claim the man has several recent drug and gun convictions, although he’s on probation. Poynter points out that the man in the photo with Hodges works as a canvasser for a local nonprofit. In September, while out collecting signatures outside a grocery store, he was tackled and handcuffed by a police officer. The story made the news, especially given that the man was released at the scene and not charged with anything, and that the officer, Tyrone Barze Jr., allegedly threatened to shoot several witnesses who were protesting his treatment. That’s probably all just a coincidence, though. The cops probably just really, sincerely believe that the mayor’s in a gang. KSTP hasn’t yet responded to any of the criticism over their report.